Rock Magic cracked the $1million in earnings with a sensational win in the Group 3 Belmont Sprint on Saturday over 1400m at Belmont. Up against the State's best sprinters, including Railway Stakes winner "Scales of Justice", Rocky again showed why he is the "Best in the West" with a perfect ride by his loyal jockey Jarrad Noske. Settling just behind them on the fence, Rocky travelled beautifully throughout. Jarrad pulled him out wide as they straightened and probably had to let him go a bit earlier than he wanted as he was losing momentum on the leaders. But when he clicks him into gear, there is none better than Rocky for point-to-point speed and he went straight past them down the longer Belmont straight. He was getting a little tired on the line, but he still had a clear margin to Scales of Justice, who was gallant in defeat. The cheers of "Rocky, Rocky" have become familiar at both Ascot and Belmont in the major sprint races, with his band of loyal followers again in full voice. He has certainly become the "people's horse" and the joyful scenes at every victory are well known across anyone that follows horse racing in this State. 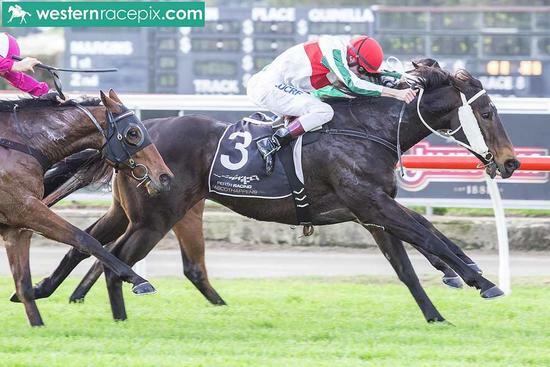 Rocky has now won 4 Group Races and 3 Listed Races, as well as finishing third in the Group 1 Winterbottom Stakes. He will now have a well-earned break before being set for a Victorian sprint campaign in September, before returning for another crack at the Winterbottom in November. No matter what he does from here, Rocky is the best horse to ever race in the Gangemi Racing colours and has done us all proud.